All those phrases are apt for my second featured cheese of the week, Tome d’Aquitaine. 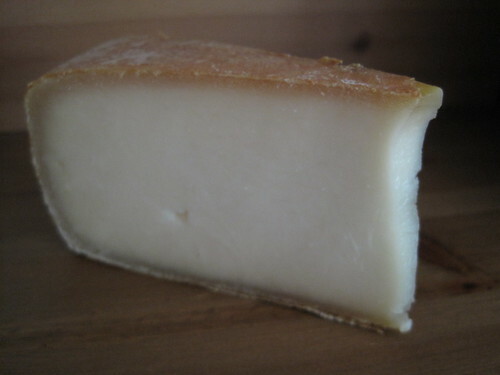 Also known as Clisson, this French goat’s-milk cheese takes cheese worship to a whole new level. Its paste is light, floral and salty, with a smoothness that makes it easy to inhale. During the dog days of August, Tome d’Aquitaine is a breath of fresh air – perhaps a breeze blowing off the Atlantic. I don’t meant to get all poetic – it’s just that good. Tome d’Aquitaine is another example of how cheesemakers can work in tandem to create tantalizing cheeses that neither could fully develop on its own (see Clothbound Cheddar, Cabot and Jasper Hill, and Grafton and Faribault Dairy). This cheese begins its journey in the Loire Valley (a premier goat-cheese-producing region) at the Union Laitiere de la Venise Verte, a dairy cooperative that produces cheese, butter and baby formula. Later on the wheels of Tome d’Aquitaine travel to Bordeaux, where renowned affineur Jean d’Alos washes the rind in brine and Sauternes. The result – total cheese bliss. Serve it up with a dry white wine, like a Muscadet from the Loire Valley. Psst…this cheese also makes a great birthday gift, and I’d share it with a certain birthday girl today if we didn’t live 1,000 miles apart. Happy birthday, Colleen! There are blue cheeses, and then there are blue cheeses, and Persille de Malzieu, from the Langeudoc-Rousillon region of France, definitely falls into the latter category. See all that marbling in the cheese’s paste? That means it doesn’t skimp on sharp, spicy blue flavor. When Colleen and I did our taste test/photo shoot with the cheese a few weeks ago, I thought it may have tasted so strong to us because our pregnancy-altered palates are a bit sensitive, but no, apparently it tastes like that to everyone! You may not have heard about Persille de Malzieu before. I certainly hadn’t before embarking upon this project. Availability can be spotty (hence, our ordering it from Murray’s rather than buying it at a Minneapolis or D.C. area cheese shop), and it’s a raw sheep’s-milk cheese, which often results in smaller production because sheep make far less milk than cows. But if you’re a blue-cheese lover and can get your hands on it, jump at the chance. 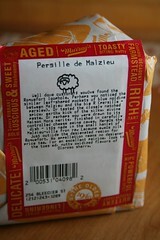 Pesille de Malzieu is very moist and salty with a fantastic tang to it. It’s not as creamy as C+C favorite Roquefort, but with a good whole wheat cracker (we love Carr’s) and something sweet on the side, like a raisin chutney or dates, it would be a very satisfying dessert. Wine pairings tend toward the sweet as well – look for a Sauternes or Port. I consider Stilton to be the grand dame of blue cheese. It’s not quite as old as some of the French blues, like Fourme d’Ambert, but it’s one of the first cheese that comes to mind when I think “blue cheese,” and it just has the regal quality about it. It is first thought to have been made in early 18th-century England, and even though it wasn’t made in the town of Stilton, many travelers en route from London to Scotland would stop here and purchase the cheese, thus the moniker. •There are just six dairies in the world licensed to make Blue Stilton cheese — Colston Bassett Dairy, Cropwell Bishop, Long Clawson Dairy, Quenby Hall, Tuxford & Tebbutt Creamery and Websters. •Stilton is a “protected name” cheese and by law can only be made in the three counties of Derbyshire, Leicestershire, Nottinghamshire. 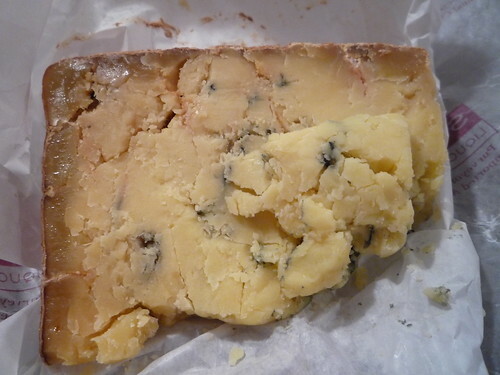 •It takes 136 pints milk (78 litres) to make one 17 lb (8kg) Stilton cheese. •More than 1 million Stilton cheeses are made each year. •More than 10 percent of output is exported to some 40 countries worldwide. •Every cheese is graded before leaving the dairy to ensure only cheese of the highest quality is marketed under the Stilton name. •White Stilton is also a protected name cheese and is made in a similar way to its blue cousin – except that no mold spores are added and the cheese is sold at about 4 weeks of age. It is a crumbly, creamy, open textured cheese and is now extensively used as a base for blending with apricot, ginger and citrus or vine fruits to create unique dessert cheeses. OK, enough with the facts. 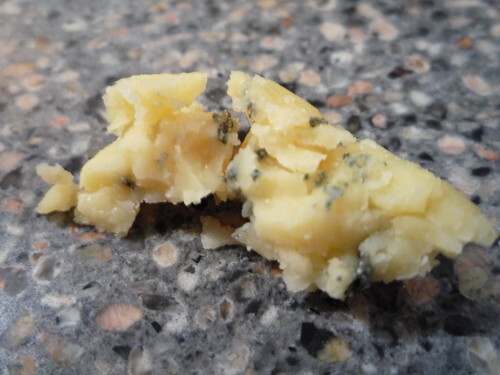 How does Stilton taste? It’s on the stronger side of the blue-cheese spectrum, with a meaty, almost smoky flavor that fills your mouth. Though pasteurized, this cow’s-milk cheese offers enough oomph for even a raw-milk purist. I, of course, would be perfectly happy eating it straight from the wrapper, but it would also pair nicely with fresh fruit, such as apples and pears. The Stilton Web site also suggests plum bread and mango chutney, which would be intriguing to try. Blue cheese=Port in many wine-and-cheese enthusiasts’ minds, and it’s certainly a good match, but keep an open mind when purchasing an accompanying wine. A sweet dessert wine or a full-bodied red would also work nicely. Artisanal Cheese and many other sites recommend a Sauternes if you’re not a fan of Port or are looking for a change from the usual wine. Have you had enough French blue cheeses this week? 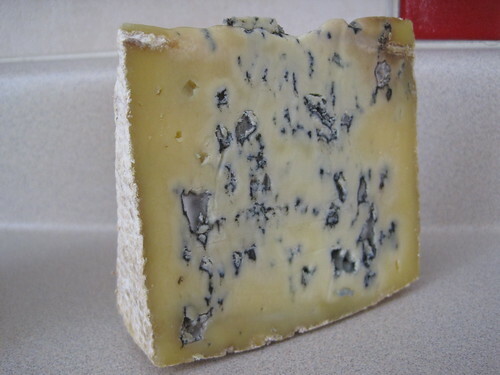 I hope not because we’ve got one more – Fourme d’Ambert – and it’s an oldie but goodie. Production of this raw, cow’s-milk cheese reportedly dates back to Roman times, and its appearance does bring about a vision of ancient, craggy rocks, I suppose. 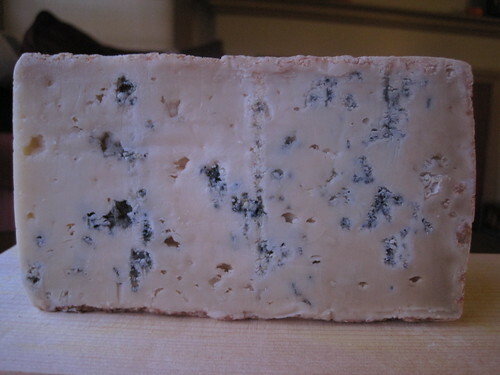 Fourme d’Ambert’s crumbly texture and blue molding make look unappealing to non-blue lovers, but it’s a fantastic cheese to try even if blue isn’t your thing. It has a distinctively blue taste but is still easy on the palate, and I love the way the cheese coats the mouth without becoming too overwhelming. Fourme d’Ambert would be wonderful crumbled on a salad, but try it as part of your dessert course with some dark chocolates. You won’t go wrong pairing Forume d’Ambert with a port, but other wines are just as suitable. Artisanal Cheese recommends a sweet Sauternes if the cheese is serving as your dessert. 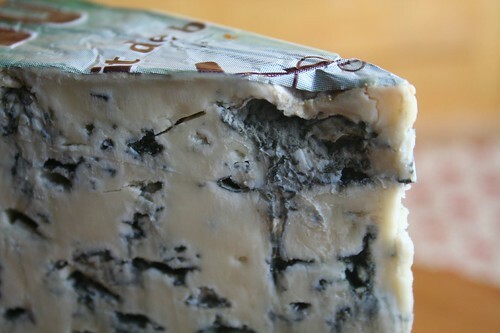 Other suggestions (fr0m Fromages.com) include Vouvray, Côte d’Auvergne or Banyuls. Still unsure about playing matchmaker with cheese and chocolate? 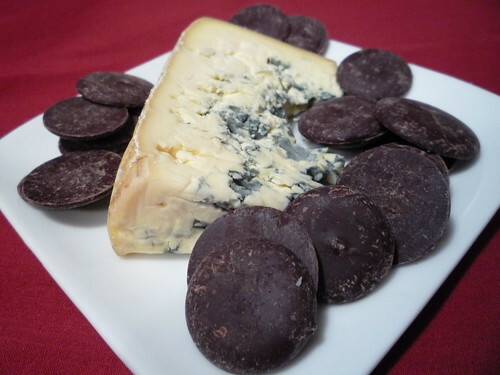 Check out the great article on cheese and chocolate pairings in this week’s Serious Cheese column.